Low Mileage, Heated Seats, Bluetooth, Power Seat, Touch Screen! 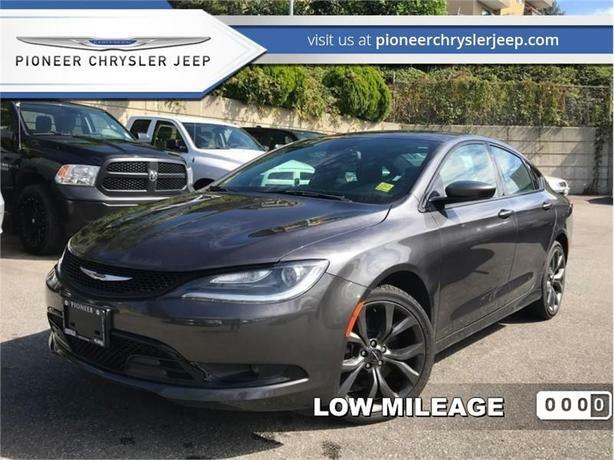 For a modern, sophisticated sedan that feels like a luxury car, but is priced like an economy car, the sleek Chrysler 200 is an unbeatable value. This 2016 Chrysler 200 is for sale today in Mission. The Chrysler 200 is a prodigy of style and agility, increasing its driver's freedom to travel confidently. This is where the everyday commuter meets weekend getaway for the perfect balance of premium design, power, fuel efficiency and driving dynamics. The sleek exterior offers an athletic stance with a lively engine that's both responsive and efficient. Get a superior driving experience and an exceptional value with this Chrysler 200. This low mileage sedan has just 24352 kms. It's grey in colour and is completely accident free based on the CarProof Report. It has a 9 speed auto transmission and is powered by a 295HP 3.6L V6 Cylinder Engine. This vehicle has been upgraded with the following features: Heated Seats, Bluetooth, Power Seat, Touch Screen. It has some remaining factory warranty for added peace of mind. To view the original window sticker for this vehicle view this http://www.chrysler.com/hostd/windowsticker/getWindowStickerPdf.do?vin=1C3CCCBG7GN176528. / Total cost of borrowing $5345 ). See dealer for details.